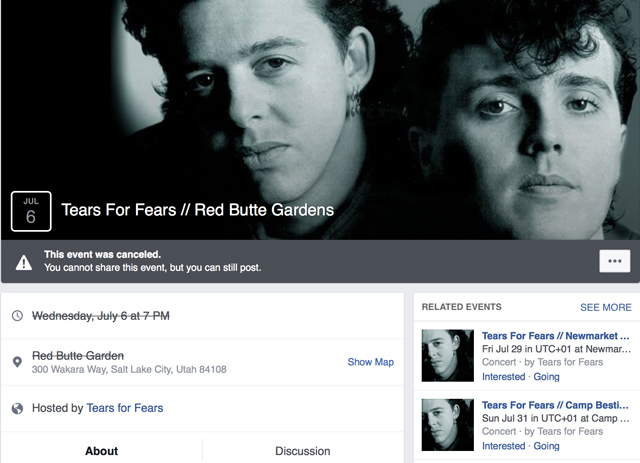 Around the middle of April, I got notification from several Tears For Fears social media sources that they would be coming to Salt Lake City this summer. You don’t know how excited I got. I didn’t even care how much tickets were. I just knew it’s been many years since I last saw them live. I had several attempts to travel to see them, but never did for whatever reasons. No more excuses. Once the pre-sale was live for Red Butte Garden members, I secured my tickets. Yes, the tickets were $67 each (plus some fees), but no worries. I blocked out July 6th on my calendar. Two hours after the pre-sale, the show was sold out. I was happy that I made the purchase. Tickets to the general public went on sale May 2nd, but I didn’t worry as I got mine before they sold out. Back on May 19th, the above message showed up on the band’s official web site. Twitter and Facebook updates happened at the same time. My heart sunk. Crushed, I was, at this news. Yes, it’s due to a family illness, which I totally understand and they should always put family fist. But still bummed at this news as a long time fan of this band. The schedule update changed to cancelled as well. Now to contact the Red Butte ticket office to see if it’s just postponed and keep our tickets or will we get refunds. A day after I contacted the Reb Butte ticket office by phone, where I talked to an agent who wasn’t sure of the details on the cancelled or postponed concert, I received the above email confirming the show had been postponed. At least they didn’t say cancelled. 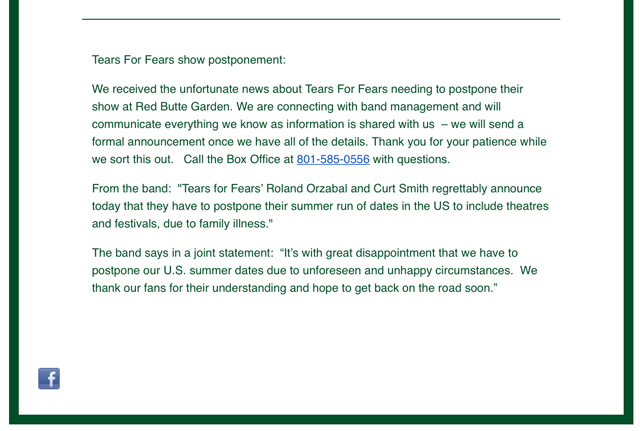 In fact, re-reading the official post on the band’s website, it clearly states postponed. This is good news and means they will be back. Just not sure when, as there haven’t been any forthcoming details on where things are. 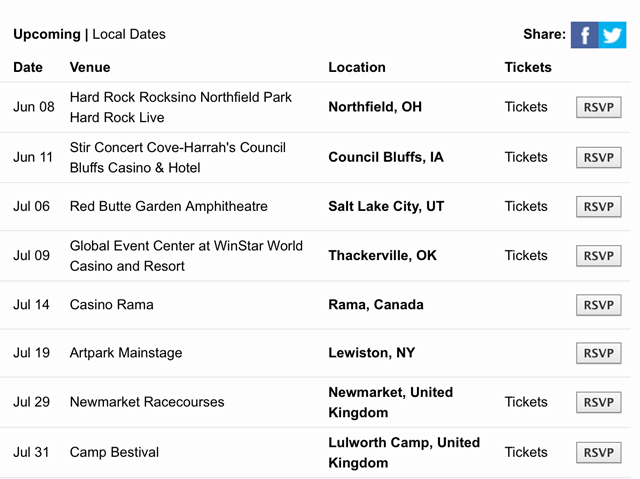 But… if the show has been postponed, why does the Salt Lake City date (and a few other US dates) still show up on the band’s web site? Also, the listing for the Red Butte site still shows “SOLD OUT” in red letters. There are still some official updates that I am waiting to hear before I give up hope on this. 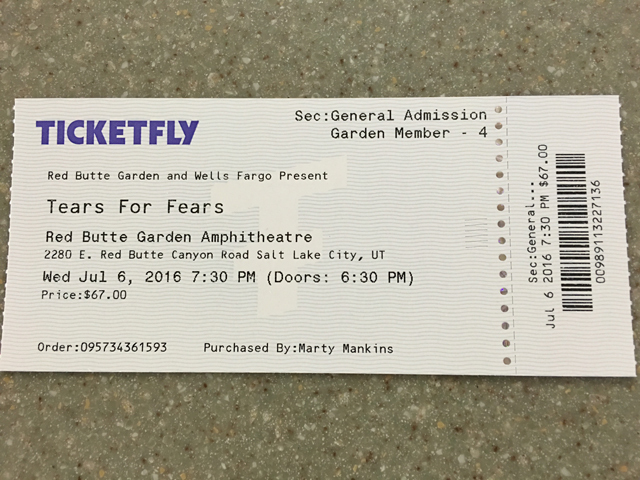 I will be sure to update with a sad or happy status of the SLC concert for Tears For Fears. 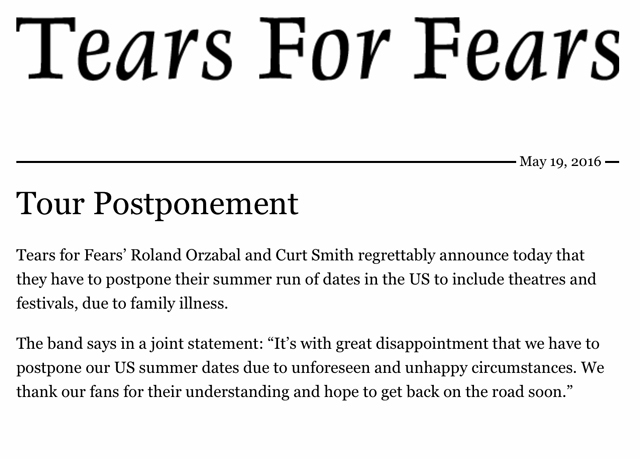 I read about their tour postponement. If it really is off, I hope they not only come back soon, but come to Phoenix this time. Yes, I hope they schedule a Phoenix date as well. Judging from tour date updates on their official site with the SLC date now removed (all US dates are gone), I would say we wait for rescheduled dates. I’m hoping for happy news for you. That would be a great show. Alas, all US dates including the SLC date, are gone from the official TFF web site. Now waiting to see when rescheduled dates happen.